Need to read an old data file (pre V4.00). Intermittent problem with dialog boxes being displayed behind the calling form. SusProg3D will run on all current Microsoft Windows operating systems: Windows Vista (32-bit and 64-bit), Windows 7 (32-bit and 64-bit) and Windows 8 ( 32-bit and 64-bit). Windows XP moves to 'Extended support' phase on 14 April 2009, with a planned end of life 8 April 2014. Windows Vista Home Premium is the minimum edition supported. SusProg3D has not been tested on Windows Vista Home Basic. Both 32-bit and 64-bit versions of Vista are supported (although SusProg3D is still a 32-bit application). 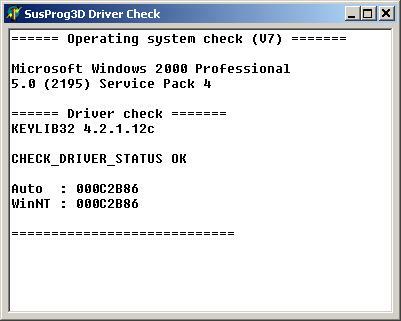 Both 32-bit and 64-bit versions of Windows 7 are supported (although SusProg3D is still a 32-bit application). We do have plans to produce a native 64-bit version of SusProg3D, but are reliant on our compiler and component vendors producing 64-bit versions. Unfortunately we cannot put a date to this. If the Registration form does not display the registration data, or the form is blank, then you will need to reset the registration data. Download SusProgDeregister and save to a temporary folder. Using Windows Explorer open the folder then right click on SusProgDeregister and select "Run as administrator"
We have not done any testing on Mac systems and do not support any hardware and/or software issues when running on a Mac. We have no plans to produce a native Mac version. Find the section that refers to "Hardware acceleration"
Using Windows XP, this is under Settings, Advanced, TroubleShooting. Turn the hardware acceleration down from "Full" to "None". Support for SusProg data files prior to V4.00 has been deleted. If you have data files saved with SusProg versions prior to V4.00, then download the Convert utility which will read all data files prior to V4.00 and save them in the V4.05 format. The default data file extension is now S3D. Only observed when using Windows XP. SusProg3D Version 4.33a (and later) supports the fix provided in Windows XP SP 1. With Windows NT based operating systems (Windows XP, Windows Vista, Windows 7 and Windows 8) you must install SusProg3D as an Administrator or a user with Administrative rights. Copyright Â© 2009 Robert D Small. All rights reserved. Revised: 21 March, 2013 .